Law is an ever-evolving mechanism. New situations merit enactment of new laws. But a legal system, which is overburdened with stalled cases, is surely in need of revamping. 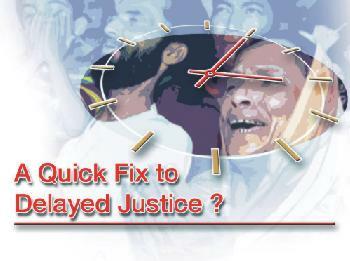 In absence of a total makeover the speedy trial tribunal act has been proposed as a solution. It is introduced as an appendage--a separate cell or a special arrangement--that would facilitate a quick penal procedure. When the majority of the cases are left in the loft of the regular courts, and a handful ones are to be considered under the speedy trial act, the question remains, whether this new law is just a face-saver for the government. In the context of the sinking law and order situation, the efficacy of this new trial procedure seems a tenable cause to stand for it. After several cases being resolved with an unprecedented quick pace, it has whetted the enthusiasm of the public. People, with expectations have rallied in support of this new tribunal. The act works in accruing quick verdicts. But the question remains, will it be effective, as well as accurate, in meting out justice? Will the verdicts remain the same after being heard in the High Court? These are the questions that are being raised by experts. SWM examines the nature and the ramifications of the Speedy Trial Tribunal.